South and North Korea will meet at a youth football tournament in China later this month, a civic group in Seoul said Monday, a move aimed at promoting inter-Korean exchanges despite escalating inter-Korean military tension. The South-North Sports Exchange Association said that South and North Korea will compete at an international under-15 football tournament that will be staged in Kunming, China, from Dec. 19 to 22. The two Koreas and China will send two teams each to the tournament. They'll be first divided into two groups, and the top two teams from each group will enter the knockout stage. This is the third edition of the youth football tournament that is also known as the "Ari Sports Cup." The inaugural event was hosted by Yeoncheon County in the South's Gyeonggi Province in 2014 featuring six teams from four nations. 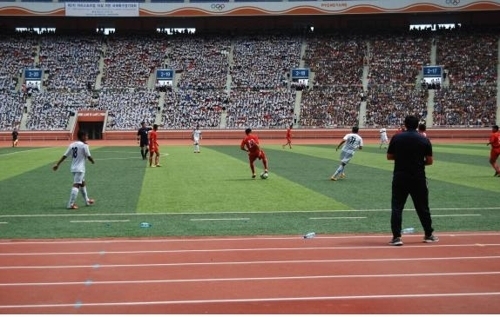 The second edition was staged in Pyongyang in August last year with eight teams from six countries. The football event was canceled last year following the heightened tension between the two Koreas. This year, South Korea will be represented by two teams from Gangwon Province. The South will send a group of 60 players and officials to China on Dec. 13. North Korean teams have been in Kunming since Saturday. "We expect the youth football exchange between the two Koreas to be carried out regularly through this tournament, " the association said. "We also want to see inter-Korean exchanges expanding to other sports and help improve the relationship between the two Koreas."